Time flies when you’re having fun, indeed. First quarter of the year is ending, and since Holy Week came in a little early, March became a busy month for most koristas, especially those in the church ministry. We got to thank our church musicians for making our Holy Week more solemn, reflective, and meaningful with their beautiful music. March is also Women’s Month, so here’s a feature on three women–sisters, actually–who are great choristers I admire (and I sure am you will, too, and be encouraged to sing in a choir as well, after reading this!). 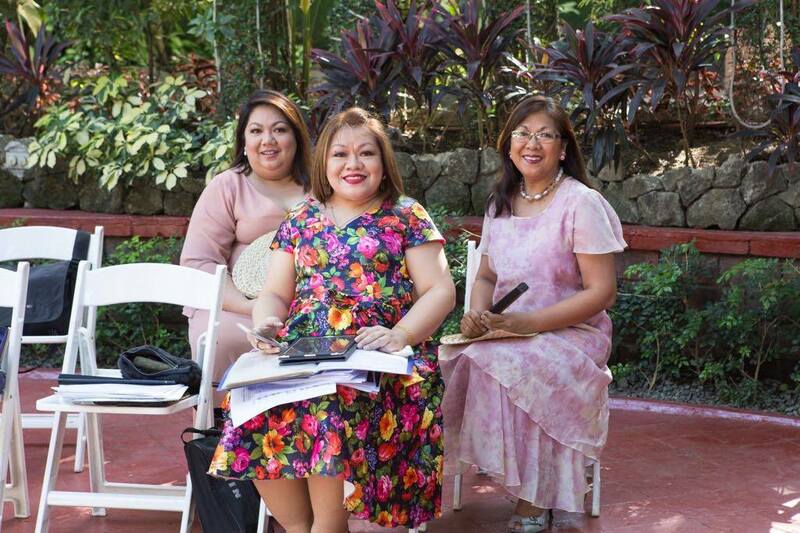 Presenting our Koristas for this month, the De Pano Sisters: Nell Armin De Pano-Raralio (Armin), Nina Rose Aurora De Pano (Niner), and Nelda Aurora De Pano-Supnet (Dada). L-R: De Pano Sisters–Dada, Niner, Armin. Belonging to a family of choristers (church choristers at that), all three currently sing (and go on concert tours) together with the Ateneo Chamber Singers. And apart from being choristers, Armin has a day job as a GM of a logistics company and GM of a back-office service provider, Dada is a stay-at-home wife and mom, and Niner is a session musician and gospel songwriter. Dada sings Alto 2, Armin sings Soprano 2, while Niner started to sing Soprano 2 but is now assigned the Alto 1 line (Their voices almost complete the treble section!). What choirs have you joined, from past to present? Dada: As I remember it: KFUMC Cherub Choir, KFUMC Tagalog Choir, KFUMC Chancel Choir, Himig Scientia, Tanglaw Singers, ACGC, SINAG, Uno, Ateneo Chamber Singers, Philippine Chamber Choir, San Miguel Master Chorale, Philippine Vocal Ensemble. Presently actively singing with The Ateneo Chamber Singers and the KFUMC combined Tagalog and Chancel Choirs. Armin: 1) Church: Kamuning First United Methodist Church, all choirs as I grew up: children’s choir, tagalog choir, Chancel Choir, youth choir, etc., as member, conductor, or accompanist (Male Chorale). “The singing Methodists” is the underlying tradition in our early and unbroken involvement in church music. 2) School: Intl School Manila: Girls Chorus, A’Capella Choir, and the high school Octet. In Ateneo, Ateneo College Glee Club. For 2 years also, I was a member of the Saringhimig under George Hernandez of UP and AILM. 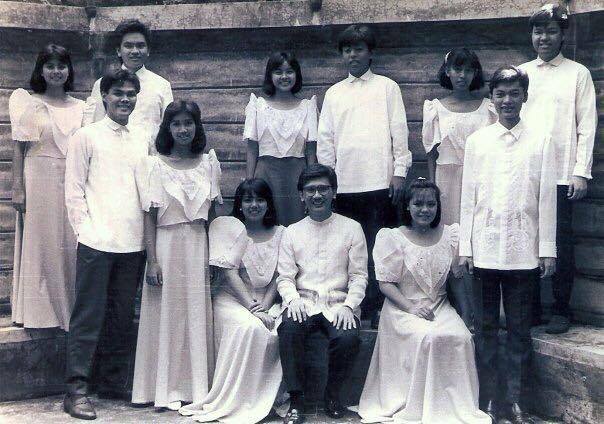 3) Ateneo Chamber Singers, which I joined the year after I was widowed. Singing again in a serious (serious?!!??) choir was a real comfort and companion to me in my widowhood, doing something I enjoyed, something challenging (no joke entering a choir at age 46—it was most humbling!) and something that allowed me to be in the close fellowship of people in ACS. It’s a joy to be in this family. Niner: As my sisters related, started singing with the choir as a young child (with Ate Armin as conductor!) with the Kamuning First United Methodist Church’s CHERUB CHOIR. In my teens I sang with the youth choir otherwise called TAGALOG CHOIR under my Dad’s sister Zenaida Parungao at first, then under Kuya Arnel (De Pano, another De Pano sibling who is notable as chorister, composer, and arranger). Then on to the big leagues, the adult choir, the Chancel Choir under, originally, my Dad’s sister Zenaida, afterwards under Ate Armin and Kuya Arnel. It would be fitting to acknowledge the great Methodist tradition of singing any time, anywhere — aside from my siblings, uncles and aunts and cousins were in the choir with us one time or another. I also sang with our high school choir HIMIG SCIENTIA under Mrs. Letty Lomibao – that was in Quezon City Science High School. During my HS days I also sang with Tanglaw Singers, a Methodist youth group made up of youth from different churches. Then Sinag, another Methodist youth group under Kuya Arnel music ministry. For some time I was an honorary singing member in SARINGHIMIG under George Hernandez. I then sang with the Ateneo College Glee Club under Joel Navarro. I also got invited to sing with the HIMIG SINGERS of Davao under Alvin Aviola aka Max aka Kuya Bong. Joined the SMMC too. And Philippine Vocal Ensemble. 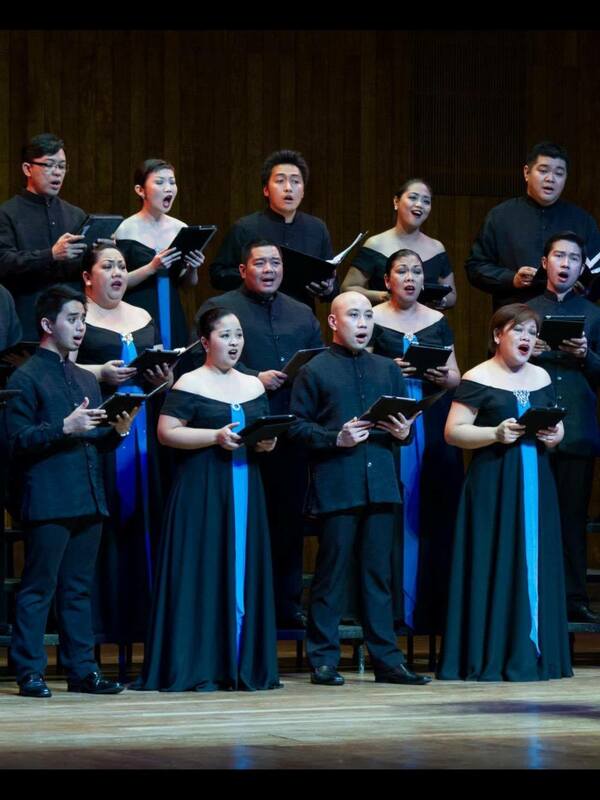 And of course the ATENEO CHAMBER SINGERS. Why did you join the choir? What was that something (or someone) that influenced you? Dada: Music has always been my family’s ministry. So I joined the Cherub Choir at around 5 years old and I never stopped singing since. Armin: It was the most natural thing to do—we were born to singing Methodist families on both sides. All of us 9 siblings went the same route, sang in all choirs, as ALL our children also became inevitable recruits to the children’s choir of their generation. Sadly, as in my children’s case, the kids have been less passionate about choir singing. The reason we sing is because it really is a gift the Lord has given every singer to be used and made fruitful—music is the language of the soul, singing is twice praying, etc. What is worship without song? A wedding without music? A celebration, a thanksgiving, or a sadness, a yearning, without expression in music? Mahirap, no? For me the power of music is akin to the beauty of nature. You capture a little, and, really, it’s a lot: for the singer, for the listener. And so we sing. Praise God! Niner: Joining the choir is a natural progression in my family — what with numerous aunts, uncles, parents, siblings to emulate. I stayed with the choir because of the joy it brings. It has since become my ministry. What is your most unforgettable choral moment? Armin: As you see in Slum Books, “too many to mention.” Every time we get a song right is a choral moment for me. Every time we hear/encounter beautiful choral music (other choirs) is a choral moment for me. And to have known, remain friends with, to work and sing with, the generation of the great movers of Philippine choral music: what a kick it is. It makes me proud, thankful, and humble. Niner: Gaya ni Ate (Armin), every singing event is a choral moment to me — some grander than normal but every time I sing brings out the best in me. Dada: Probably when I was part of the all children’s choir that lined up the Malacañang Palace driveway and main lobby singing Handel’s Hallelujah Chorus and ‘Christus vincit, Christus regnat; Christus, Christus imperat!’ during Pope John Paul’s very first visit to Manila. I was still in Elementary School then. A close second would be singing for the Papal Mass with Pope Francis in January 2015. As sisters, have you toured with the choir together? Dada and Niner touring together during college. Dada: I have toured with Cha Nanu (their nickname for Niner) more times than with Ate Armin. To wit, with ACGC in 1986 for the United Airlines’ Sister-city Exchange Program (to Sacramento, CA); with ACGC again in 2000; with SMMC to Taiwan and Korea in 2002-2003; with the Ateneo Chamber Singers in 2003 (US), 2006 (Europe and Singapore, with Ate Armin also), 2008 (US, Nanu only), 2009 Tokyo, Japan and Taipei (with both Ates), 2012 to Sapporro, Japan (with Nanu only), 2014 to Singapore (with both). Armin: They (Niner and Dada) have also been session musicians together; just over a year apart, age-wise, they’ve been together a lot more. More recently, the three sisters sang with the ACS in Singapore for the Three Festival in 2014. How was the experience being with family members in a choir? Armin: We love it. My siblings and I sing together every Sunday in church, year in, year out. Of 9 children in the family, 7 of us were members of the Ateneo College Glee Club,& 2 of my sisters in law were ACGC members, too, making us quite possibly candidates for the biggest Glee Club family. My Kuya Albert and I were in Saringhimig together. And, as you know, the DePano siblings were in SMMC* together, too. We like each other, we like singing together. We are also big supporters of Arnel’s entire music ministry. Buy One Take All applies to us. Dada: As the youngest of us 3 there is more financial security when touring with the Ates. Hehehe. Niner: Masaya! We push each other to sing our best — pulisan sa nota, okrayan at tawanan sa mistakes. But I think having siblings in the choir contribute much to the homogeneous sound of a choir — our voices share a timbre that naturally blend. With the Ateneo Chamber Singers in a concert at the Philamlife Auditorium. Big thanks go to the De Pano Sisters for sharing their simple lives intertwined by music. #KoristaAko is powered by Touringkitty. Tune in for the latest post every last week of the month. Follow on Facebook, Twitter, and Instagram for updates.